Wind energy record growth was reported for the last quarter of 2013 by the US Wind Industry Fourth Quarter 2013 Market Report. The American wind energy industry took advantage of the extension to the Production Tax Credit in 2013 by “building an unprecendented number of new wind farms,” the American Wind Energy Association (AWEA) informed. Wind energy record growth was also the result of investments in technological breakthroughs that have helped drive down the cost of wind energy by 43% over the last four years. There were more wind power megawatts (MW) under construction in the United States at the end of 2013 than ever before, with more than 12,000 MW of new generating capacity under construction. 10,900 MW new generating capacity construction started being built in Q4 2013. This is the equivalent of maintaining the power needs of 3.5 American homes. 2013 saw a record number of long-term PPAs (power purchase agreements) signed. Utilities and corporate purchasers signed 60 PPAs for almost 8,000 MW, a new record. Major wind energy record growth is set to occur in Michigan, North Dakota, Kansas, Iowa and Texas. Turbine orders for more than 5,600 MW have been placed by major manufacturing facilities in South Dakota, Iowa, Kansas and Colorado. Uncertainty regarding Production Tax Credit meant that 2013 saw a slow start for the wind industry. The tax credit was briefly allowed to expire on December 31st, and was then extended by Congress and signed back into law on January 2nd. When the Production Tax Credit has been allowed to expire, US industry is usually faced with a 70% to 85% drop-off in installations; in 2013 that drop-off amounted to a 92% in new wind generating capacity brought online. “That dropped from the record 13,131 MW of new capacity installed in 2012, to just 1,084 MW in 2013, a pattern that could repeat unless Congress acts,” the AWEA informed. However, the industry rapidly recovered in the fourth quarter of 2014. 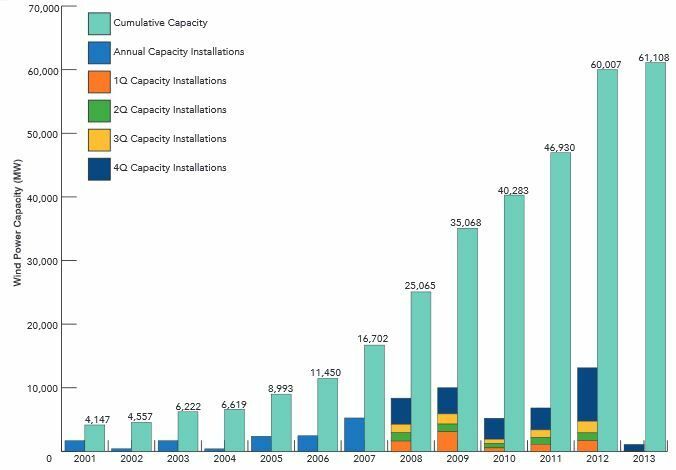 Q4 2013 saw 1,012 MW of 1,084 MW of new wind farms installed in 12 states plus Puerto Rico were completed. The momentum gathered in Q4 2013 is forecast to carry over into 2014. However, we are again faced with uncertainty over tax policy, which will undermine new project development. Thanks to wind energy, the US now has 100 million fewer tons each year of carbon dioxide emissions. This figure is set to grow rapidly as wind energy moves toward providing up to 20% of the grid. Wind turbines harness the energy in moving air, i.e., wind, and convert it into electricity.